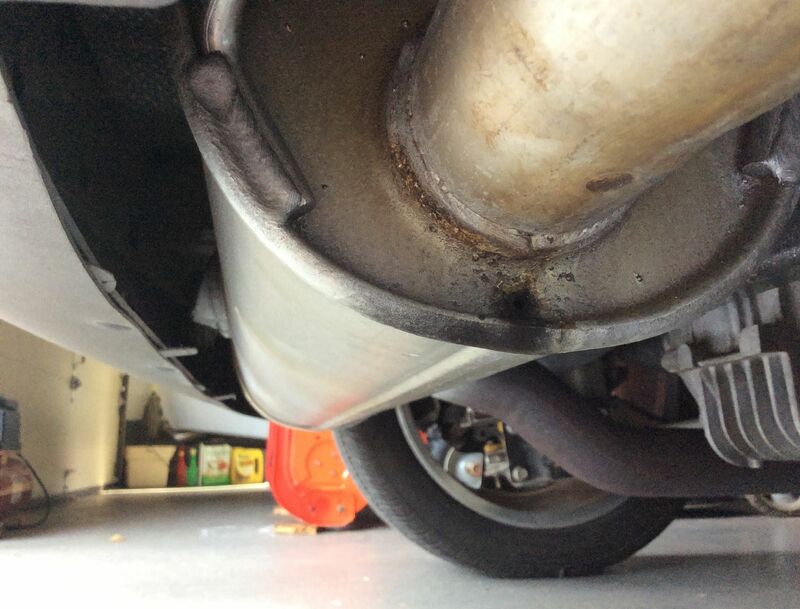 Today I noticed a dark spot under the exhaust of my 2.4ltr Solstice, caused by dripping water, not uncommon. But this time it was not from the exhaust tip but from the muffler. There turned out to be a tiny "wheep hole" near the muffler exit connection. Seems like a tiny hole so no immediate action required, but some time this summer I want to fix this problem. 1) Get it welded, think that is possible. 2) Get a near stock aftermarket copy. Are they available ? 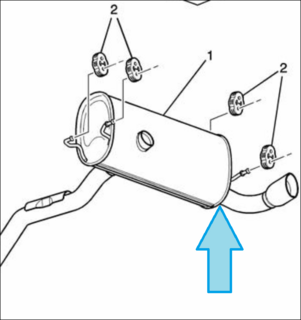 3) Get a new stock muffler. Are they available ? 4) Get a used stock muffler via Ebay / Craigslist or the forums. Dave his famous YMMV applies. 6) Get a kit from SoloPerformance that includes more than just the muffler. 8) Get a kit from Magnaflow that includes more than just the muffler. Is this a factory hole ? I'll be out in the barn and check my spare if it's factory it's probably placed there to get rid of moisture so I would leave it if it's due to corrosion and it's just a tiny hole I would not worry about it unless you want to replace it . I have a Magnaflow on mine it's the complete exhaust from the cat back ,is all stainless and have been very pleased with it . Also just added the "GMPP Solstice Cat-Back Exhaust System" to the list. Never knew this even existed. That has to be really old stock, I haven't seen these available in a long time. I think Borla was the manufacturer for GMPP. I'll have to check my factory muffler to see if it has a weep hole there. .....I'll have to check my factory muffler to see if it has a weep hole there..
My 2007 NA Sky muffler does not have a hole. No weep hole on my stock muffler. I've patched small holes in mufflers with fiberglass cloth and epoxy. Wash area around hole with Simple Green, dry it, sand with 80 grit, clean with alcohol or lacquer thinner, apply epoxy resin over hole and surrounding area. Wire brush the metal lightly through the wet epoxy with a SS wire brush. The epoxy will form a barrier over the sanded area preventing oxygen from creating oxidation or rust while wire brushing. Place a fiberglass cloth patch over the wet epoxy and squeegee it down and remove excess resin. As soon as the epoxy gets slightly stiff but not fully dry, brush on more resin, filling the cloth weave. Repeat if necessary. Use fiberglass cloth, not mat. Mat has binders that epoxy resin can not dissolve. I use 10 oz cloth but if you have thinner cloth add multiple layers. Larger holes require a thicker fiberglass patch. Maybe a wire screen under the cloth. There are muffler patch tape sold at auto parts stores but their adhesion and peel resistance is questionable. I repaired a small hole once with tape and it eventually dryed up and fell off. I fiberglass repaired a muffler on my Silverado over 8 years ago and it has held up. My 07 NA does have a weep hole! It is located right under the exhaust tip. Red checked mine out and agree with the above no weep hole in the muffler .If it's a small hole and that's what it sounds like and you don't want to go to the expense of replacing or having it welded see if you can find some JB Weld . It's a two part epoxy that won't be affected by the heat of the muffler, it's easy to use , inexpensive around 5 bucks a pack and you don't have to remove the muffler to fix it .If your going to use it after you mix it let it set up for a few minutes it will start to thicken and turn to a putty like consistency , as usual make sure the area is clean a bit of steel wool and lacquer thinner will do the job . There are two types regular and "Fast Weld" which starts to set up relatively quick and dries in a matter of minutes .I always keep a couple of packs of this stuff around have used it for years on a number of things . Good Luck ! If it's a nice round drilled hole then yes, it's a "weep hole" for condensation. Really more of a drain hole. It's very common for a mechanic to add later if they've done exhaust work on the car and it didn't have one. If some OEM mufflers have them and some don't, it's probably just a "feature" of pre-bankruptcy GM. In either situation, if you take it to a shop to have welded expect the guy to give you a really weird look when you tell him what you want done. Never knew things like "FactoryMufflerWheepHoles" exist. Just did a quick Online Repair Manual check and there seems no mentioning of a factory wheep hole. I have the GMPP exhaust system on my GXP. It's a very nice piece with the Pontiac arrow head symbol embossed into the chrome tips. Nice sound too. The weep holes are there for a purpose. They allow condensation that collects to drain rather than accumulating in one area and causing rust out from the inside. I don't know that I'd go crazy drilling holes in mufflers that didn't have this feature, but I also wouldn't plug up the ones that did. Sting Ya and phil1734 like this. Nope, my 06 1st 1000 still doesn't have a hole in the exhaust. My wife wants to know why I was lying on the garage floor staring at the bottom of my car. "I'm just checking something for the guys on the forum." My '07 NA exhaust doesn't have a hole, but both RL exhausts do.